Synthetic diamonds are chemically, physically and optically identical to earth-mined diamonds, but they are man-made with the use of advanced technology. There are two key methods for making synthetic diamonds, High-Pressure-High Temperature (HPHT) process and Chemical Vapour Deposition (CVD). Given that they are produced in a laboratory, synthetic diamonds are cheaper than natural mined diamonds and they can always achieve the highest purity. 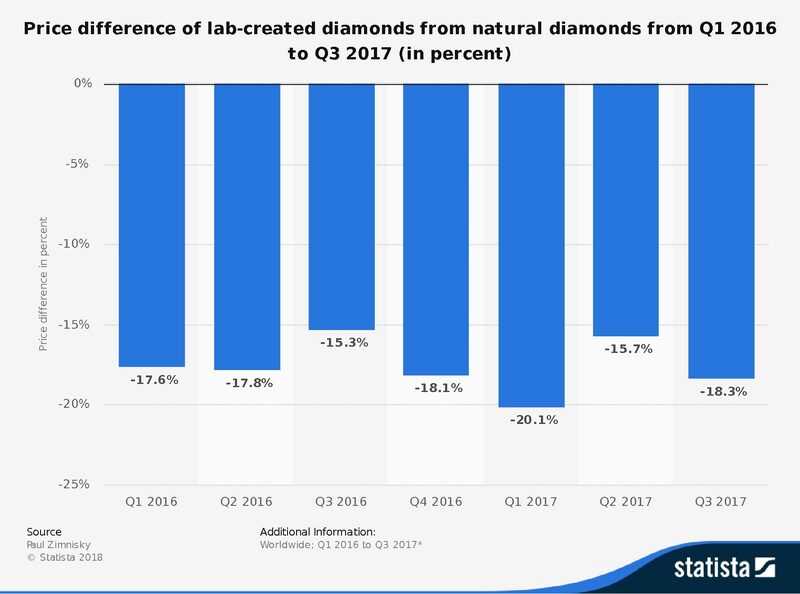 This chart shows the price difference between synthetic/lab-created diamonds and natural diamonds worldwide, from the first quarter of 2016 (Q1 2016) to the third quarter of 2017 (Q3 2017) in percent. The trend is not steady, anyway the data show that lab-created diamonds have costed at least 15.3 percent less than naturally occurring diamonds, in the last two years.